MOLLUSCA : NUDIBRANCHIA : Pseudovermidae SNAILS, SLUGS, ETC. Description: This tiny worm-like nudibranch will only be found by using special techniques for collection of meiofauna, ie. animals which live between sand grains. 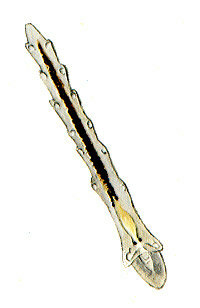 The cerata are reduced to swellings along the sides of the body, and are mostly composed of cnidosacs. The body is transparent. There are rudimentary rhinophores and conspicuous eyes. The body length reaches 3.5mm. Habitat: Feeds on the interstitial hydroid Halammohydra vermiformis. Distribution: Apparently known only from the original locality on Anglesey, and from the Bristol Channel. Unlikely to be encountered except by deliberate searching, so may be more widespread. Worm-like animal with acorn-shaped head. Cerata reduced to swellings on sides of body. Picton, B.E. & Morrow, C.C. (2016). Pseudovermis boadeni Salvini-Plawen & Sterrer, 1968. [In] Encyclopedia of Marine Life of Britain and Ireland.